Our range of products include absolute digimatic height gauge, dial height gauge and vernier height gage. 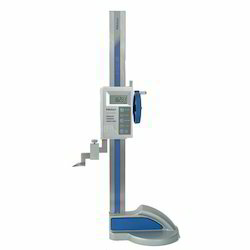 We are distributor & trader of Absolute Digimatic Height Gauge. Built in absolute linear encoderThis encoder eliminates the necessity of setting the reference point at every power-on. It has improved reliability because no over-speed error will occur. Rigid column structure ensures high measuring accuracy. With large smooth slider feed wheel. We are distributor & trader of Dial Height Gauge. Provided with a feed wheel for easy coarse feeding. The counters and dial can be re-zeroed at any scriber position. We are a Vernier Height Gage supplier in chennai. Our products are available in major brands with wide range of specifications.